To see pomegranate in your dream refers to journey. To dream that pomegranate arils are red and big denotes a visit which will be made to a distant place. 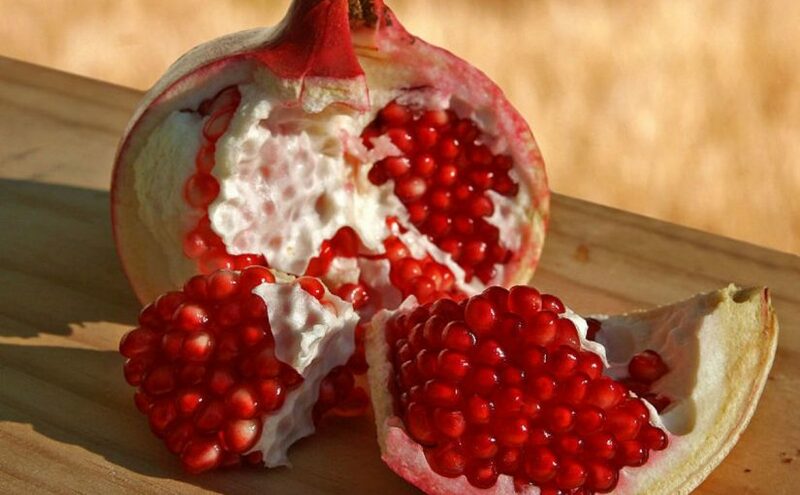 To see that pomegranate has no aril in your dream means that you will have a bad trip. To see pomegranate on brach in your dream symbolizes a gain which will be gained at the end of journey. To see of collecting pomegranate in your dream suggests that you will migrate to another city and settle there. To see that you buy and sell pomegranate or there is pomegranate in bazaar in your dream refers to a travel which will be made with family members. To see that pomegranate juice is poured in your dream means that you will have a travel regarding your child. To dream that you extract water by pressing pomegranate may represent that you will have some problems during a journey. If you drink pomegranate juice in your dream, it means that you will create a problem. To dream that the taste of pomegranate is sour suggests that you will meet new people during your travel and make good relationships with them. If its taste is sweet in your dream, it forewarns you that people whom you will meet during your trip will do evil to you afterwards.